Suitable for surface or suspended (with optional suspension kit) mounting. Electrical connection either via connector in endcap (version END) or via flap in rear of body. Linear continous run by connecting output socket in endcap (all versions) and connector in next luminaire (END versions) with an optional electrical connector. 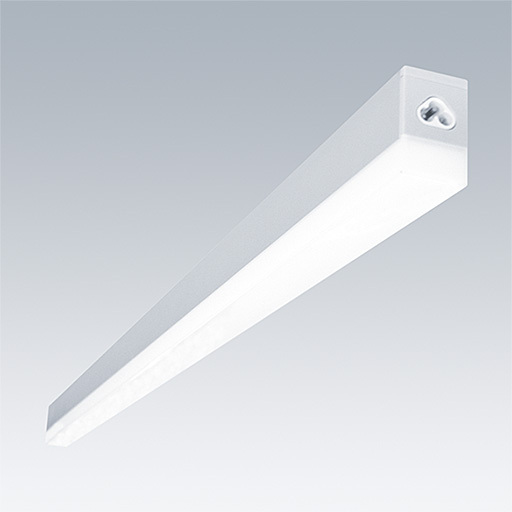 A slender LED batten with aluminium body and opal PC diffuser, lengths of 580mm and 1180mm. High efficacy up to 117Llm/W. Can be individual or continuous mounted. Provides lumen packages of 1050, 2100 and 4200lm.